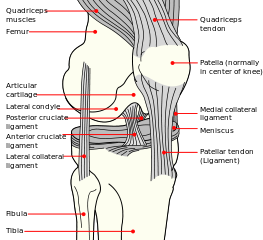 The normal translational movement of the patella in the fossa intercondylaris at the front of the femur is guided by the tendons of the M. quadriceps femoris, the depth of the groove, the own intrinsic structure of the patella and the localization of all muscles and osseous parts. The localization of the patella is specifically determined by the borders of the femoral condyles, the balance between vastus lateralis and medialis and by the ligamentous support of the medial and lateral retinaculum. Osseous abnormalities contain patella alta and baja, a high tibial tuberosity and trochlear groove distance trochlear dysplasia like a shallow or convex fossa intercondylaris, patellar dysplasia, an external tibial rotation or internal femur rotation. A lot of studies pay attention to a weakened M. vastus medialis obliquus associated with patellar malalignment. This component of the M. quadriceps femoris may be proximally positioned and vertically orientated and may even not reach the patella in patients with patellar malalignment. As a result, the effectiveness of the VMO as a dynamic stabilizer get lost. Other soft tissue abnormalities related to patellar malaligment include: a lesion of the medial retinaculum; an increased Q-angle; tightness of the lateral retinaculum, the hamstrings, the ilitibial band and the vastus lateralis. The findings mentioned above typically focus on the joint itself while other believe that patellar malalignment may be influenced by the interaction of all segments and joints of the lower extremity. In particular, the balance between exo- and –endorotators in the hip is disturbed showing an excessive medial femoral rotation, as opposed to lateral patella rotation..
Patellar malalignment is more common in women then in men. This higher incidence in women may be influenced by anatomic factors, such as increased pelvic width, patellar height, tibial tubercle position, Q-angle and internal hip rotation. Also postural and sociological factors, such as wearing high heels and sitting with legs adducted should be considered as a possible risk factor for developing patellar malalignment. Patellar malalignment may be the underlining cause for certain disorders like patellofemoral pain syndrome, Osgood-Schlatter disease, patellar tendinitis, neural inflammation, altered proprioception (instability), venous congestion and bipartite patella. The development of pain and instability in patients with patellar malalignment seems to be set off by a trigger which varies from patient to patient. Trauma is a potential trigger. Nerve fiber changes in the lateral retinaculum can cause pain. This neural factor in combination with mechanical anomalies and knee overuse increases possible consequences of patellar malalignment. Pain as a result of patellar malalignment may be located anterior, lateral and medial of the patella. Pain may also be perceived in the popliteal area. The physical examination of a patient with patellar malalignment isn’t easy because there is no specific sign accepted as proof of malalignment. Though there are several symptoms and examinations that may help to suspect malalignment. 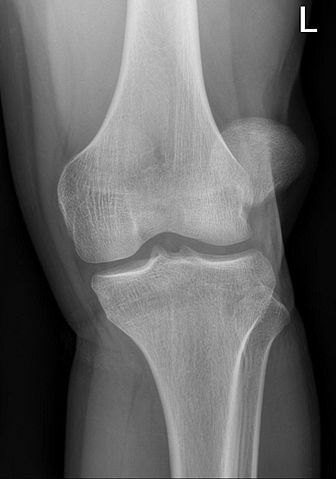 Symptoms such as giving-way, stiffness, crepitation and tenderness should arouse suspicion for patellar malalignment, although these symptoms are shared by other conditions. Lower extremity alignment, foot abnormalities such as pronation and gait should be inspected. While seated, an extension of the knee is asked. When the patient approaches full extension of the knee, the patella assumes a lateralised position. The vastus medialis obliquus may be atrophied, so cannot be identified by sight or palpation. The apprehension sign, whereby the patient becomes apprehensive as the knee is extended while a laterally directed force is applied to the patella, is an insensitive test to suspect malalignment. Patients with pain caused by patellar malalignment, have difficulties arising from a seated position and climbing stairs as these activities aggravate the pressure around the patella. It is very common to realign the patella in the fossa intercondylaris with operative interventions such as proximal and distal realignment. Physical therapy includes strengthening of the vastus medialis obliquus or the external hip rotator, effective patellar taping or bracing, balanced strengthening, proprioceptive training and stretching of structures like the lateral retinaculum, the iliotibial band, the quadriceps and the hamstrings, will help patients avoid surgery. An exercise program to strengthen the vastus medialis should be designed to enhance the quadriceps while keeping joint stress to a minimum. This program has to be specific to the patella, taking its possible cartilage into account. Early flexion activities should be avoided when patellar lesions are distal, in contrary of exercises at approximately 90 degrees of flexion which are discouraged in the presence of proximal lesions. According to another theory, an influence of other joints on patellar tilt exists. Because of this vision, patellar malalignment can not be treated separately and independent of the related limb alignment. In stead of treating a lateral patella rotation, an excessive medial femoral rotation is to be taking care of. Following this theory, the control of femur rotation may be important in restoring normal patellar alignment and so a strengthening program of hip external rotators may decrease patellar malalignment. Patellar tape and braces are designed to realign the patella within the femoral trochlea . This improves realignment and quadriceps function. Taping across an overly powerfull vastus lateralis can diminish its pull and so stimulate realignment. Another goal of taping is to pull the patella away from a painful area. ↑ 9.0 9.1 9.2 Metin Cubuk, S. et al. Tibial tubercle position and patellar height as indicators of malalignment in women with anterior knee pain. Clin Anat. 2000;13(3):199-203.